I am my Mother’s daughter; case in point, Mom was famous for bringing unusual food items into our home. Often we would stand around whatever ‘it’ was wondering what on earth we were expected to do with ‘it’, definitely not eat it! But yes, we were obliged to try it and sometimes it worked out very well (kiwi in the early 70’s (see notes) for example became a fast favourite and sometimes it did not. Lychee fruit for example, or what we sarcastically named “Eyeball Fruit” did not have a happy ending. Mom was pretty sure you could eat this raw, right out of the peel but we made her try it first anyway. She didn’t die immediately and wasn’t offended by it but my brother and I (under 10) were skeptical and hesitant to try it. We did eventually try it but it wasn’t a favourite — although we had some good giggles with the name, Eyeball Fruit. JT and I were out grocery shopping and I came across Chickpea Flour Twigs and true to form, I grabbed a pack and tossed it into the cart. By now (almost 30 years) JT has learned not to question, just accept it — more often than not, it will become something tasty for him, anyway. Upon my return to the house I did a little investigating and discovered that this unusual treat is a snack food; to be honest, I wouldn’t know how to eat it…it’s so tiny and crumbly (if any of my readers know how to eat this, please let me know in the comments). But it reminded me of an elusive Greek dough called kataifi (shredded Phyllo dough which I haven’t been able to find) so I thought breading shrimp with it would work out well. Also I got a new social media client and they dropped off a bunch of their product so I decided to use coconut flour in the breading instead of all purpose flour. It worked out very well. 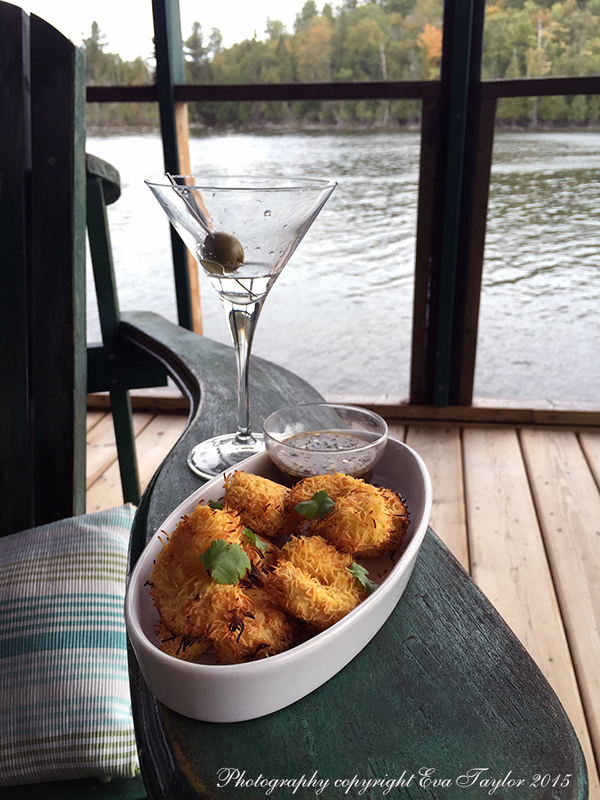 It turns out that the Chickpea Flour Twigs are deep fried so they are quite rich and rolling the shrimp in them made a nice crunchy textured batter with a mild chickpea flavour. A Kitchen Inspirations Original Recipe. Pre heat an oven to 375°F and line a baking pan with a silicon mat. To three separate bowls, add the coconut flour, the egg whisked with water and the chickpea flour twigs. Lightly dredge the shrimp in the coconut flour and then soak in the egg wash, back to the coconut flour an again in the egg wash. Now roll lightly in the chickpea twigs. Lay onto the silicon mat. 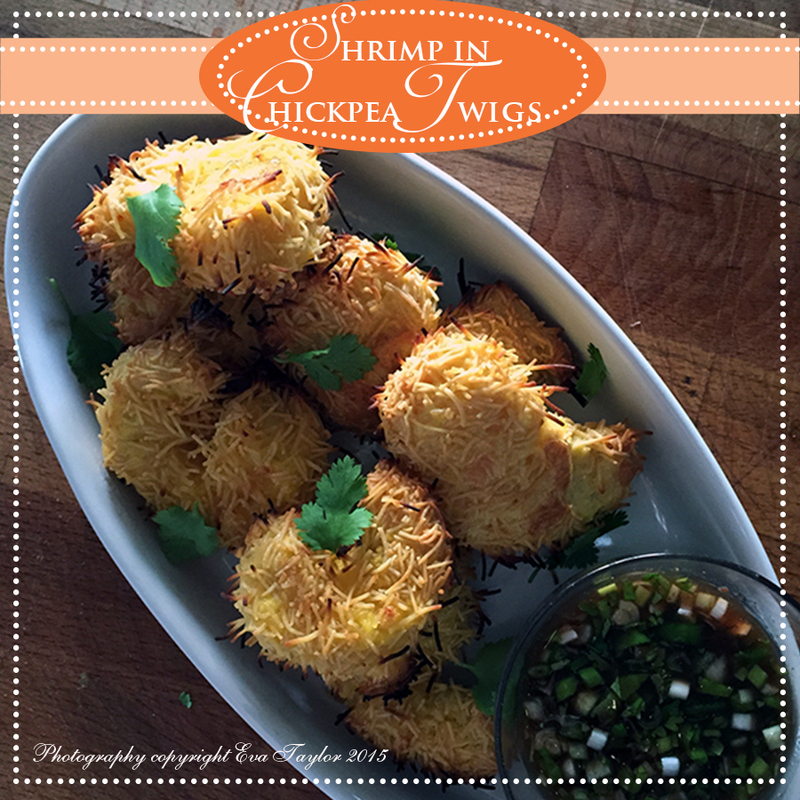 Repeat until the shrimp are all bundled nicely in the chickpea twigs. Bake for 10-12 minutes or until the twigs are even more golden and the shrimp is cooked through. Serve with a tamarind dipping sauce (I combined store bought tamarind sauce with rice vinegar, green onions and chopped cilantro). A tasty treat for cocktails. Who drank my cocktail? I usually repeat the flour dredging and the egg wash because it makes a nice crispy batter, particularly when baking in the oven instead of frying. Toronto in the 70’s (I can only attest to this point forward) was fairly mungie-cake; exotic meant spaghetti and meatballs for most. Chinese takeout was pretty much the only asian food out there, fortunately, we have evolved and we can source any ethnic food on any day of the week and it’s likely to be quite authentic. To be entirely honest, I don’t think I’ll make these again, the nutritional content of the chickpea twigs is not in my healthy realm but it was a fun treat.